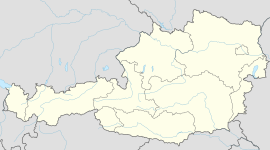 Stockerau (German pronunciation: [ʃtɔkəˈʁaʊ]) is a town in the district of Korneuburg in Lower Austria, Austria. Leisure facilities are various: wellness centre, sports centre with three gyms, judo and table tennis gym, skittle alley and football stadium. In addition there are indoor and outdoor tennis facilities. Stockerau offers a range of exhibitions, concerts, readings and singing evenings in the cultural centre "Belvedereschlößl". In the cellar of this castle, built in 16th century and revitalised by the town community in the year 1984, you will find the district museum. Between Stockerau and the Danube there is a large forest. Saint Coloman was martyred here in 1012, and is known as St. Coloman of Stockerau. Given its relatively close distance to Vienna, S3 of the Vienna S-Bahn operates half-hourly service to Vienna as well as hourly service to Hollabrunn. Regional trains operate from Vienna to Retz and Znojmo in the north and Wiener Neustadt and Payerbach-Reichenau in the south. This Lower Austria location article is a stub. You can help Wikipedia by expanding it. This page was last edited on 26 March 2019, at 17:55 (UTC).